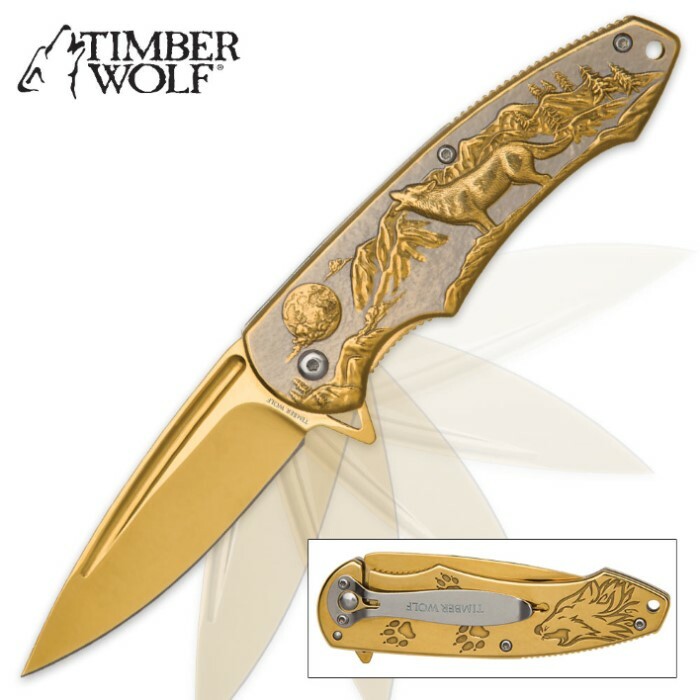 Timber Wolf Moonlight Hunter Assisted Opening Pocket Knife - Gold | BUDK.com - Knives & Swords At The Lowest Prices! Like the noble wolf, the "Moonlight Hunter" Pocket Knife is an awe inspiring fusion of breathtaking beauty and deadly ferocity. 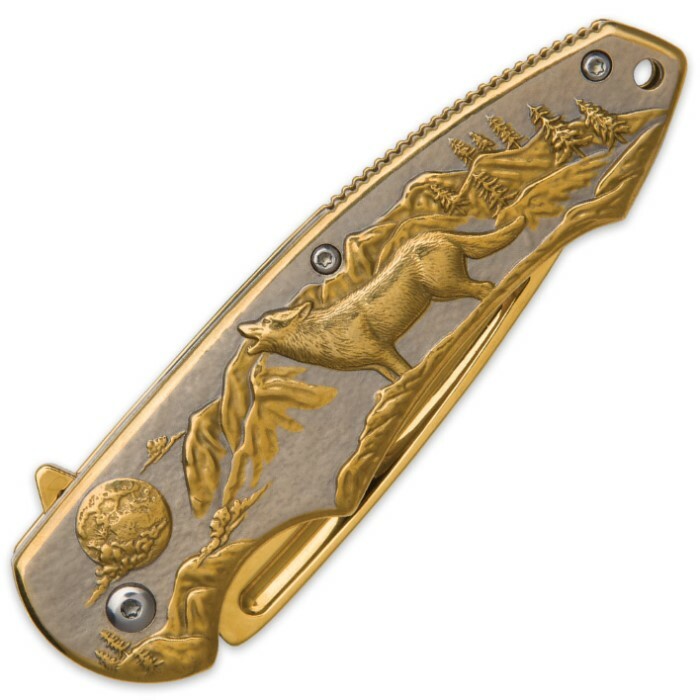 Rendered in intricately detailed, delightfully tactile 3-D relief, the steel handle depicts a lone wolf on a mountaintop, howling at a full moon as he surveys his mountainous, forested night domain. The raised portions of the scene are colored a gleaming golden hue - the perfect complement to the vibrant golden 3 1/4" drop point blade. Forged from rugged stainless steel and polished to a brilliant glow, the blade is razor sharp and visually stunning. An even more dramatic spectacle, the blade deploys near instantly in a flash of bold color with the Moonlight Hunter's silky smooth, lightning fast assisted opening mechanism, which activates with just a gentle tug of the handy flipper. Even the back of Moonlight Hunter's handle is a sight to behold, as it's embossed with delicate paw prints and the stately bust of howling wolf. With its incredible visual appeal, the Moonlight Hunter is perfect for display. But it also makes a convenient everyday carry, thanks in part to the built-in pocket clip and lanyard hole. Regardless of what you decide to do with it, there's no question this distinctive assisted opening folder will draw gazes and admiration. 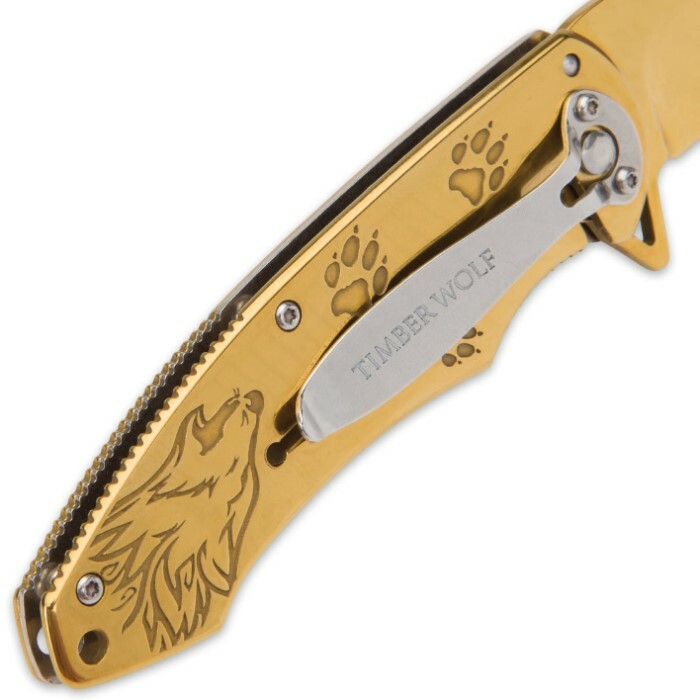 Great in the display case and great in the field, Timber Wolf's Moonlight Hunter Pocket Knife is both a beauty and a beast.